Ipsen designs and manufactures industrial vacuum and atmosphere heat-treating systems, supervisory controls systems and predictive maintenance software platforms for a wide variety of industries, including Aerospace, Automotive, Commercial Heat Treating, Energy and Medical. With production locations in America, Europe and Asia, along with representation in 34 countries, Ipsen is committed to providing 360° support for customers worldwide. Choosing Ipsen means choosing a partner in success. Ipsen USA continues its outstanding performance through the second quarter with the shipment of 18 furnaces to companies in six states in the U.S. and two companies overseas. These shipments included multiple atmosphere furnaces, plus the shipment of one of the largest vacuum furnaces Ipsen has ever built. This horizontal furnace features a 210,000-pound (95,254 kg) load capacity that is equipped with eight 35″ diffusion pumps and a stainless steel shielded hot zone assembly that is capable of achieving ± 5 °F temperature uniformity. 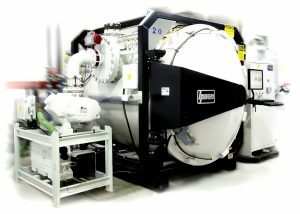 Ten atmosphere box furnaces were shipped to a company in the Aerospace industry, while one temper furnace went to a U.S. based Commercial Heat Treater. Other shipments included three TITAN H2 (18″ W x 24″ L x 18″ H) 2-bar furnaces and three TITAN H6 (36″ W x 48″ L x 36″ H) 2-bar furnaces. All of these TITANs are equipped with Ipsen’s unique PdMetrics® software for predictive maintenance. Many of these companies took advantage of Ipsen’s support offerings, which include Ipsen U training, spare parts kits and installation supervision/start-up. Ipsen continues to support the diverse needs in multiple industries around the world with innovative heat treatment processes that utilize the latest technology. The original beta tester for the TITAN®vacuum furnace when it first launched – and the proud owner of more than 24 other Ipsen furnaces – Rockford Heat Treaters (RHT) remains focused on providing their customers with high-quality options so they can stay competitive in today’s market. As RHT continues to invest in their plant and equipment, they recently purchased a TITAN H6 to expand production capacity and cater to increased demand. As a commercial heat treater, process versatility is essential in a shop where requirements change on a day-to-day, or even hour-to-hour, basis. Part of what appealed to the company about the TITAN product line is its high adaptability and part cleanliness. In fact, when they purchased the first TITAN furnace, it gave them the flexibility to expand their customer base and take jobs not previously possible. Their newest furnace continues in this tradition, and it will join many other Ipsen furnaces, including a complete atmosphere line of seven integral quench furnaces with ancillary washers and tempers, more than a dozen draw furnaces, a VFS® vacuum furnace and four other vacuum furnaces. The TITAN H6 has a 36″ W x 36″ H x 48″ D (915 mm x 915 mm x 1,220 mm) all-graphite hot zone with a 3,000-pound (1,361 kg) load capacity. Equipped with a diffusion pump, this furnace allows them to meet Aerospace requirements and process sensitive materials that require deep vacuum levels. RHT also took advantage of several Ipsen support offerings, including on-site inspection of the installation, equipment start up and personnel training. This support, coupled with Ipsen’s inventory of speculation-based TITAN furnaces, allowed RHT to begin processing customer parts within five weeks of issuing the purchase order. The TITAN vacuum furnace incorporates years of customer feedback to deliver user-friendly features, all while maintaining a global platform, small footprint and short delivery times. Available in several sizes and horizontal or vertical configurations, the TITAN provides powerful performance for both experienced and first-time heat treaters. 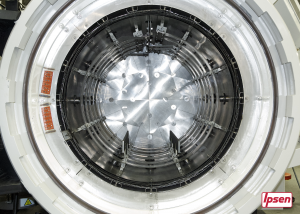 With a focus on pursuing additional market sectors, including IGT and Aerospace, Diamond Heat Treat purchased a Titan H6 vacuum furnace with 6-bar gas quenching from Ipsen to expand their capabilities. They will also rely on Ipsen to provide local, hands-on support for installation, start-up supervision and personnel training. 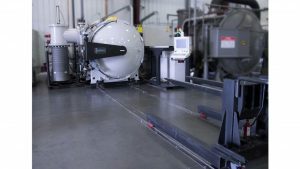 While Diamond Heat Treat – acquired by Calvert Street Capital Partners – already has three vacuum furnaces at their Rockford, Illinois facility, the new Titan furnace’s range of process capabilities allows them to better address key needs for different markets. One of Ipsen’s modular heat-treating systems, the Titan features a 36” x 48” x 36” (915 mm x 1,220 mm x 915 mm) work zone with a 3,000-lb (1,361 kg) load capacity. This furnace is also capable of operating at temperatures of 1,000–2,400 °F (538–1,316 °C) with ±10 °F (±6 °C) temperature uniformity. Overall, Ipsen’s Titan vacuum heat-treating systems provide an advanced solution with their ability to deliver powerful performance, cutting-edge technology and immediate delivery.